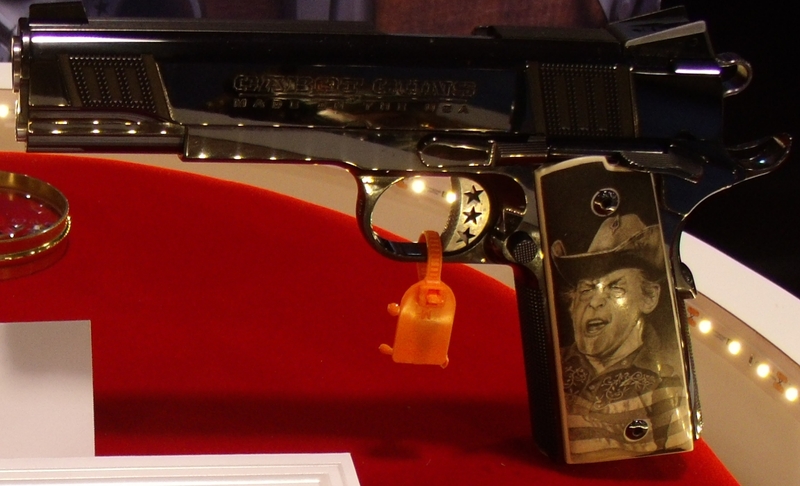 At Shot Show 2014 Cabot Guns made quite a splash with their mirror image 1911 pistols. These two guns were true right and left hand 1911 pistols. The right had all the conventional controls, ie. safety, slide stop and magazine release that we are all used to. The Left gun however was totally backwards (as you might expect) with the controls on the wrong side of the gun. Which makes sense when you see the scrimshaw by Darrel Morris on the grips. The Left gun has Piers Morgan on the right grip and Obamo on the left grip. 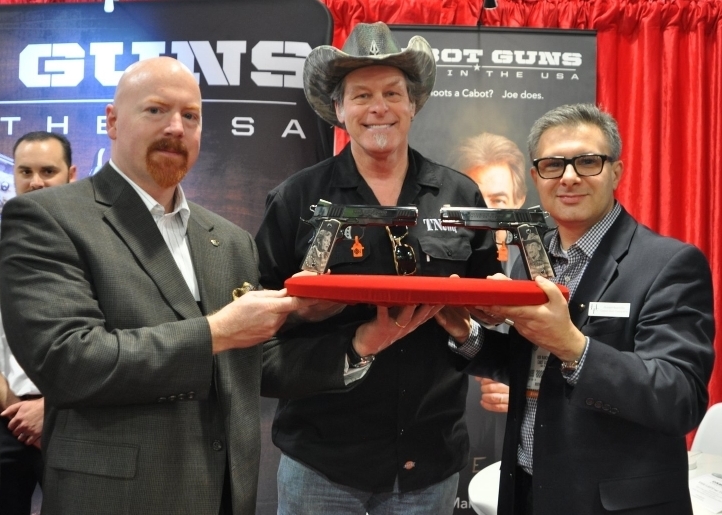 The Right hand gun has Ted Nugent on the left grip and G.W. Bush on the right side. So when the two guns are muzzle to muzzle you have Morgan facing off with Nugent on one side and Obama with Bush on the other. 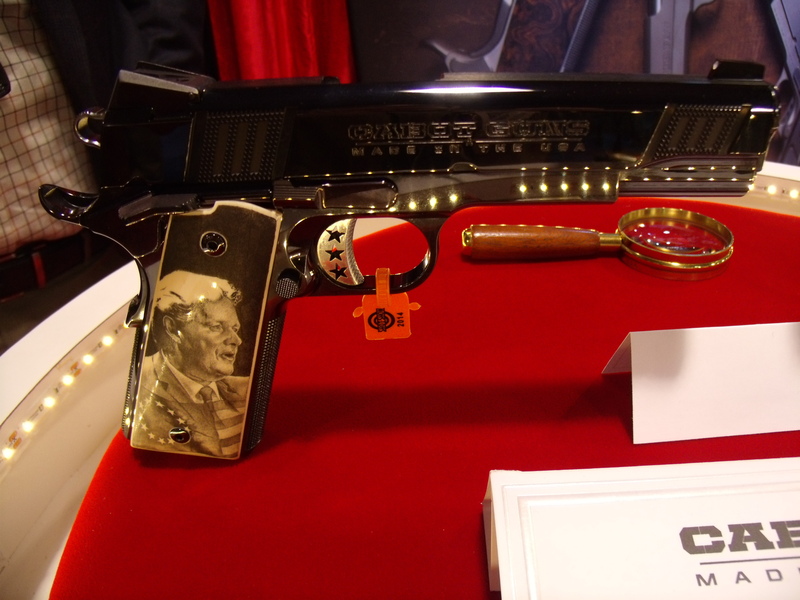 The display highlights the great American gun debate. 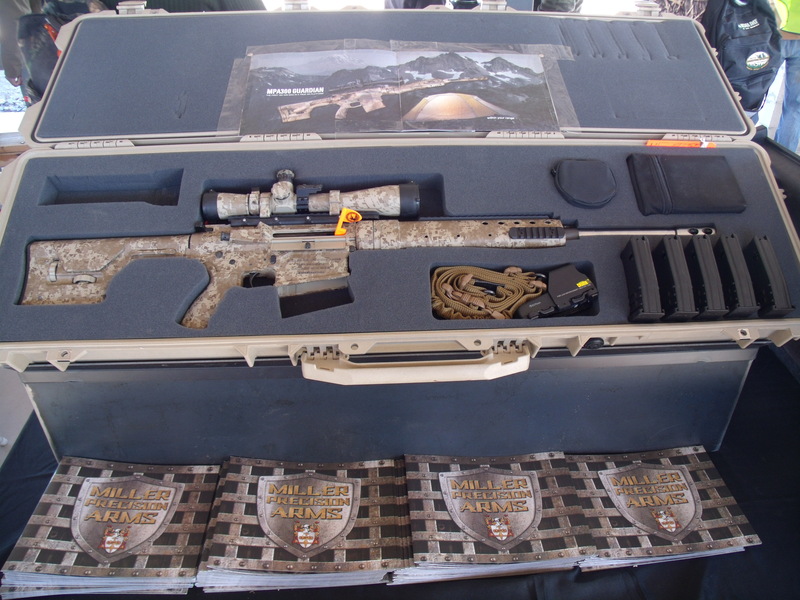 Cabot Guns was launched in 2011. 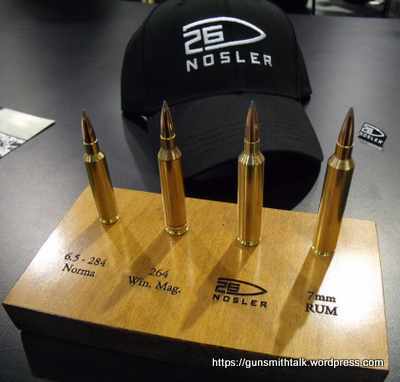 In a short time, the company has won two consecutive NRA National Pistol Championships. The Cabot 1911 has been described as “the Rolls Royce of 1911’s” by S.P. Fjestad, Author and Editor of the “Blue Book of Gun Values. DuraCoat is finally available in an aerosol can. This new aerosol was made possible by the development of this new “can in a can” technology which allows the components to mix inside the can. This product differs from some other finishing products in that the product is activated, so it must be used within 48 hours of activation. 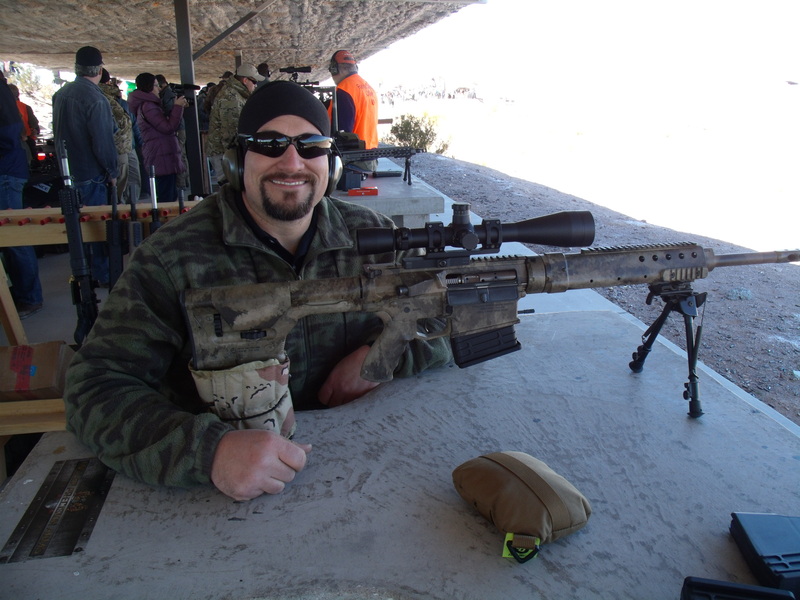 Some gunsmiths and hobbyist are concerned about buying large quantities of product. For small shops this may be a great answer to that inventory problem. Colors available in this new form are Matte Black, OD Green, Pink Lady, Magpul flat Dark Earth, White, Black-Hawk Coyote Tan, Combat Gray, and Woodland Green. 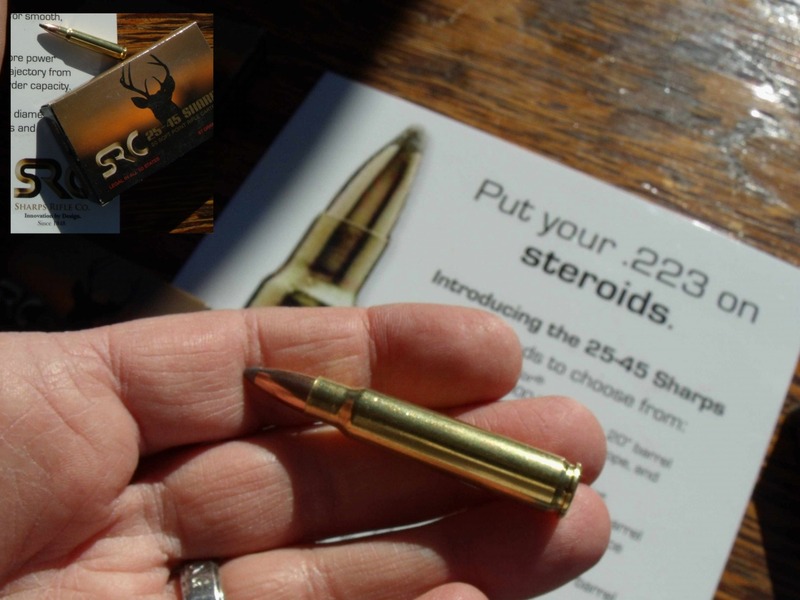 Each 12 ounce can contains enough material to coat two rifles.